ADI has been calling on the Coalition Government to be more open and transparent concerning the licensing of circuses with wild animals since plans for the unworkable scheme was first introduced. ADI has time and again highlighted how circus regulations are doomed to failure. A travelling circus cannot provide wild animals with the facilities they need. Animals live almost the entire year in temporary accommodation, in cages that must be small enough to be packed up each week and moved to a new site. They are handled and controlled in ways that no other captive wildlife is forced to endure and they spend excessive hours shut in their transporters. These are all welfare problems that are simply inherent to the industry so cannot be addressed by standards. ADI has used the Freedom of Information Act and parliamentary questions to obtain information that should have been publicly available but Defra have remained silent. Until now. On 23 May 2013, the long overdue release of inspection reports and licence applications for the only two circuses performing with wild animals in Britain, Circus Mondao and Peter Jolly’s Circus, were published by Defra. For their licence application, circuses are required to provide details of their tour itinerary, list of animals to be licensed, the current location of the animals to be licensed, individual records, care plans and a list of authorised persons. Applications for both circuses showed that details were omitted or breaches identified, resulting in additional administrative time and expense. The inspection reports themselves raise a number of welfare issues, as outlined below, and raise questions as to the veracity of some of the statements made, as inspector/s have recounted and relied upon information that has been provided by circus staff, rather than witness for themselves firsthand. In March 2013, we revealed how Circus Mondao were touring with wild animals ahead of being granted a licence. 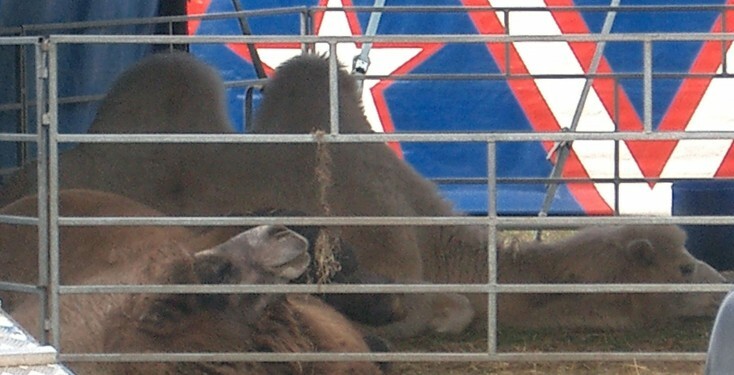 At the time Defra refused to comment on the matter, but the inspection report reveals that they were aware that the circus was touring without a licence, as it states in the report that “Performances will start on 13th February but the exotic animals will not be in the performance or on display”. because the reindeer are castrated, they do not naturally shed their antlers. As they become “brittle and deformed” the standard practice is to treat them with hormone injections to encourage them to shed. The injections, however,“cause behavioral changes in the animals and can incite aggression. This has occurred in the two reindeer who fought overnight the night before the inspection. The animals therefore have broken antlers.” This was discussed with the circus and the animals would in future be separated when the injections are administered and not reintroduced until the antlers have dropped. During the inspection of the winter quarters of the Peter Jolly’s Circus, the following breaches were identified: details of the tour itinerary had not been provided and welfare risk assessments did not contain the necessary information. Following the inspection the Defra Licensing Panel wrote in a letter to the inspector that “the circus should have sufficient experience to assess the risks at this stage” and that they “would also have expected that a generic contingency plan for travel disruption would have accompanied the journey plan templates”. Following further communication between the Panel and the inspector, the Panel’s remaining concern related to the circus’ “provisions for transport and display” which had not been assessed since the regulations came into force. Incredibly it was agreed by the Panel that the cost for undertaking the additional visit for the inspector to assess these be borne by Defra, not the circus. The inspector responded by stating that it would not be possible to assess the training aspect as the circus “only begin training once the circus is on tour” and as they were not going to start a tour until they had a licence, it was a “chicken and egg scenario”. The claim that training only takes place whilst the circus is on tour is highly questionable and at odds with the findings of our studies over the past 20 years, during which ADI has filmed and photographed the day-to-day treatment of animals in travelling circuses, the animal care practices, and studied the physical and psychological effects of performing. One of the other flaws of the licensing system was highlighted by the inspector after the Panel had stated the minimum sizes of the raccoon and snake enclosures were not provided with the circus’ application. The inspector responded that the raccoon enclosure was 1.5m x 2m (twice this size during the summer months) but that no minimum size for the species was provided in the guidance document.